In 2016, Clarkston Area Youth Assistance (CAYA) added a new program, Pinwheels for Prevention. From the onset through today, Judy Parnes has been the Chairperson. Debbie Wertz, Office Manager of CAYA, has also been involved right from the beginning. 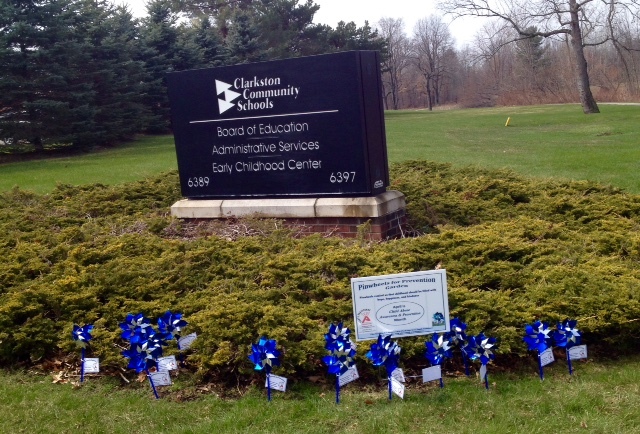 Between 2016 and 2018, CAYA’s Pinwheels Prevention Program focused on sponsoring and coordinating for Clarkston, the nationwide campaign, April is Child Abuse Prevention (CAP) month. It was a joy to see 2000 blue pinwheels planted in 100 Pinwheel Gardens of Prevention throughout Clarkston, reminding us that childhood should be filled with hope, happiness, and kindness. In 2019, the Pinwheels for Prevention Program grew and developed in size and scope. While continuing to sponsor and coordinate the nationwide campaign, the Pinwheels for Prevention Program Committee also focused on local interests and efforts regarding the health and well-being of the community, especially, youth. Both focuses are about PREVENTION and strengthening youth and families through community involvement—a major part of CAYA’s mission! The Committee is especially proud of the bookmarks created this year to remind each member of the Clarkston community of the role he/she can play in helping youth feel safe, hopeful, and welcomed throughout the community. The Clarkston Area Chamber of Commerce has supported the Pinwheels for Prevention from the beginning. Debbie and Judy loved having the opportunity to recently give a presentation to the Chamber’s Young Professionals Network group. The Chamber is a great way to help CAYA enlist community resources and involvement for all of its programs.